Fiona Maazel is the author of the novel, Last Last Chance. 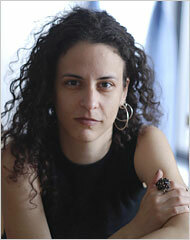 She is winner of the Bard prize for 2009 and a National Book Foundation “5 Under 35″ honoree for 2008. Her work has appeared in Bomb, The Common, Fence, The Mississippi Review, The New York Times Book Review, Tin House, Salon, N+1, and The Yale Review. She lives in Brooklyn, NY, and just finished work on her next novel, Woke Up Lonely. She is reading at Fiction Addiction THIS MONTH and answered some questions for me on writing, teaching and her new novel. Regarding the Occupy Wall Street-related piece of yours that was up at Salon the other week–Do you enjoy having a prompt to work with? How are most of your ideas generated? If you can find any sort of pattern to it, where would you say your stories/novels grow from? Sometimes it’s easier having a prompt. I’ve written three pieces like this in the last six months–one for Glamour, one for This American Life, and one for Salon.com, and they were fun insofar as I felt relieved of the onus to justify putting words on paper, my thinking being: Hey, they *asked* for this. Coming up with plot ideas is really not my forte; I’m sure this is why I write maybe one short story a year and generally stick to novels. Plot never seems to interest me as much as it should. I usually start with some kind of emotional predicament I’m interested in and then just see what I can do to outfit it with a plot. This might sound unlikely, since my first book and the one I just finished are heavily plotted and oddly at that, but I promise I’m telling the truth. Where did the idea for Woke Up Lonely, specifically, come from? The book’s about a cult leader, his ex-wife, and the four people he takes hostage. But I’m not sure where I came up with the cult leader. I knew I wanted to write about loneliness and fracture among people; that was my starting point. Next I thought up a fat man who spearheads a movement to secede from the union. Then he got skinny. Then he got moody. And next I knew, he was a cult leader running a giant therapeutic community whose mandate is to assault or eradicate loneliness in America. I was at Yaddo when I first started in on the book and saw that great film, The Lives of Others, and so the next day I got up and started to write about a guy who gets spied on by some creepy lady and then a woman who gets spied on by the same creepy lady until it seemed like this creepy lady might as well have something to do with the cult leader, at which point she became his ex-wife. In short: I just kind of muddle my way forward until things start to make sense to me. I rarely know ahead of time what I’m doing. How did the writing process for your second novel compare to the writing process for your first? It was much harder. The first book was hard to plot, but easy in terms of its voice and narration. This new book, with its multiple characters and points of view; the fractured manner of its telling; its range and digressions–it nearly did me in. I don’t mean this to sound dramatic; I just mean to say that I wanted to write a book that was much more intelligent than I am. And I suffered for it. I understand that a third novel is now in the works? Yep, but who knows what it’s about besides a guy who is unknown to himself. I haven’t gotten very far. I do know that it’s set in Staten Island and that, for research, I went a few weeks ago to look around. The upshot? Poison Ivy. You teach in the CWP at NYU. Have you learned anything from your students? I think they’ve made me much more attentive to what I’m doing on the page. Often, I just do stuff without thinking, and I make bad choices. But teaching forces me to articulate ideas about fiction writing I didn’t know I had. And then to apply what we talk about in class to my own work. What advice do you find that your students most often need to hear? That writing IS revision. Most of them want to write a draft and be done with it. Maybe two drafts, tops. I tell them some writers spend 6 months on 6 pages. This always seems to floor them. Hell, it floors me, but that’s what writing is. Never settling. You made a very interesting comment in a discussion for Authors at Google about “enabling” vs. “disabling” writers to read, both types being writers you admire. I think this is a condition a lot of writers suffer from–encountering work they love that either inspires them to produce or stops them dead in their tracks, thinking “well there’s no chance I will ever do that.” Can you talk a little about some writers you have found to be one or the other, or perhaps both at different times? Who inspires you, who overwhelms you? It’s certainly changed over the years. When I was just starting out, I remember reading Purple Americaand thinking: Okay, forget this, I have no chance. Years later, I reread it and while I loved it just as much, it wasn’t traumatizing any more, just inspiring. Like: read a great thing, now go try to write one. Denis Johnson is inspiring to me in this way. Jose Saramago. I can still get shut down by Cormac McCarthy. And I’m always shut down by the greats like Melville or James. So I am very careful about what I read when, though mostly I just want to read it all. You said in the same interview that you see art as a compulsion, because “why would anyone willingly want to do this?” As someone who sees it as such, do you ever have doubts in your ability to produce art that is meaningful and effective? Ha. Every day. Every second. Who cares what I think? Why bother? I don’t remember saying I think making art is a compulsion, though that sounds right. Even so, these days it feels more like an indulgence and joy. Who cares what I think? Probably no one, but never mind; I keep at it because it’s still the most fun I get. Last but certainly not least: Why do you write? See above. Because it’s fun. It’s *really* fun. When it’s going well, there is no better feeling. This is a bad analogy, but watch me make it anyway: Imagine yourself playing an instrument, playing fast and hitting all the right notes–doesn’t that feel amazing? Writing can feel like that for me, and so whenever my writer friends begin to despair about their work, I always tell them just to try to recoup the fun of it all first. Forget what they are working on. Just let it rip. Howl at the moon. Go nuts. Obviously I have to tell myself that, too, since when it’s going badly, it feels horrible. I get depressed. Certain I will never write anything decent again. My life is over. It’s all over! But then maybe I write a sentence and kind of like the way it sounds. And then there’s this guy in the sentence who was born with giant ears and just got one pinned back to see how it would look and it looks great, only for some reason, he can’t afford to get the other one pinned. And he runs an organic cheese bar. And off I go. And I’m happy again.